Although many people remember the VR hype of the late 1980s and early 1990s, you may not realize that the concept of VR has been around longer than that. The idea of transporting yourself to a different place had practical uses in the military and entertainment fields. For example, the US military put a lot of effort and money into making VR in order to help train pilots. These systems were crude, heavy and very expensive but they helped pilots test and train without putting them into danger. As personal computers became more popular in the 1980s VR started making public appearances. VR hype grew. W Industries (later renamed Virtuality) was one of the pioneers in making VR a household name. They released several arcade machines giving users a full sense of immersion in 1991. While the systems were groundbreaking at the time, the promise of being transported to a tropical island or flying a supersonic jet didn’t meet up with reality. Controls were clunky and computer graphics at the time left a lot to the imagination. Nintendo’s ill-conceived Virtual Boy was released in 1995. A consumer grade virtual reality system in full 3D was promised, but with few games and a nauseating monochromatic display consumers ignored the device en masse. Consumers started to realize the technology wasn’t ready to meet their vivid expectations. The VR hype train was drying up. VR suddenly appeared in the public’s eye again around 2012. Although several companies were working behind the scenes developing their own VR solutions, Oculus was the first to make it big with their $2.4 million dollar fundraising Kickstarter campaign. Shortly thereafter companies started coming out of the woodworks announcing their own spin on VR. Sony showed up with their prototype VR Project Morpheus and Valve announced the Vive after partnering with hardware manufacturer HTC. With the Oculus Rift, PlayStation VR and HTC Vive all arriving this year, it seems we are in the middle of a VR renaissance. Will VR boom and bust like it did in the 1990s, or is this time different? If you look at how fast technology innovation has been moving, it should be easy to assume that VR technology has come a long way since the 1990s. The technology needed for VR has matured significantly in the last 25 years – display resolutions number pixels in the millions, processing power is several magnitudes faster and video cards are a thing. One major issue with the last VR boom was the difference between hype and reality. With today’s technology, the immersion part of the hype should be met. The other big thing VR has going for it is that three massive companies are investing heavily in the technology. Facebook paid $2 billion for Oculus, Sony has deep pockets and Vale is everyone’s favorite game store – these aren’t some fly by night startups with no name recognition. Today’s culture is also different. We’re used to having new technology and gadgets for us to lust after. People are more willing to try new things and splurge on big electronics. Game developers are also behind the push. Hundreds of developers are working on games and applications for one or more of the above systems. Each system will have more than 30 games at launch. The quickest thing to kill a new piece of hardware is a lack of content. In all three cases, it looks like Oculus, Valve and Sony all made sure content will available during and after launch. Just because things are different today doesn’t mean VR is guaranteed to succeed. My biggest concern at this point is the cost of entry. These systems are expensive and rely on underlying technology. For example, the Oculus retails for $599 but requires a beefy video card and computer – the card alone retails for about $300. When all is said and done, a complete Oculus set up may be upwards of $1500. The Vive is even more expensive. Sony definitely has the advantage here, but if you don’t have any Sony products you are looking at the PS VR bundle and PS4 for about $850. Another item to worry about is motion sickness. Although over the last three years the technology has improved and developers are trying hard to avoid motion sickness, there will be a set of people who will feel ill playing VR – especially after long periods. With the technology being tried by many for the first time, this will be an important aspect to keep an eye on. In some respects, it feels like VR is being over hyped like it was in the 1990s. Lots of money, buzzwords and demos are being given, but it’s going to take a while to see how everything plays out. Will the content stream be deep enough to keep people busy for years to come, or will content dry up? Will people have long term affects to VR such as sickness? How long will it take for costs to come down? At this point I’m cautiously optimistic. 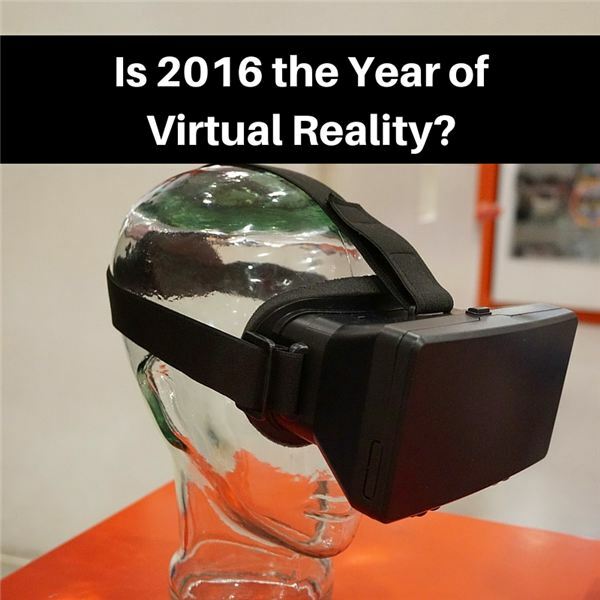 This time really is different and with the money and technology behind VR, 2016 may go down in the books as the start of a new technology paradigm.